Parenting curriculum guides often focus on a goal of providing positive parenting techniques and practices. Most parenting curriculum guides are implemented as part of parenting workshops. Many of these workshops are hosted by school districts, and they seek to encourage parents to become more involved in their parenting roles and responsibilities. Other guides are often used in workshops geared toward specific participants, such as single parents, teen parents, adoptive parents, and minorities. Understand individual parenting strengths and work with those strengths. Recognize weaknesses, and practice techniques for improving on those areas. Learn how to find joy as a parent, and share that joy with their children. Understand the developmental milestones of children. Understand the difference between appropriate and inappropriate behavior as it relates to parenting techniques. Learn how to model positive behavior-management skills as parents. Learn how to be consistent, and understand how to establish and implement reasonable expectations and rules. Work on building and maintaining a positive relationship with every member of the family. Become more aware of the variety of resources available, both in the community and online. Why should parents participate in curriculum guides on parenting? The desired outcomes will of course differ depending upon the parents' needs, strengths, and weaknesses. However, many parents find that they feel much more capable as a mom or dad after completing a series of lessons on this particular curriculum. In some cases, parents learn how to deal with discipline issues regarding their children. In others, parents may learn how to feel more confident in making decisions regarding their children. Teen parents may learn all the basic aspects of parenting, while single parents may find the support they need to go it on their own. 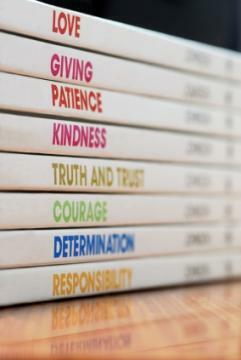 Where can you find guides for parenting curriculums? Check with your local school board. Call the chamber of commerce. Ask your child's pediatrician for information. Contact your local child advocacy center. Prepare Tomorrow's Parents provides a clearinghouse for instructional materials pertaining to parenting. The Baby Think It Over Program is designed for teens. California Department of Education's Home Economics, Careers and Technology Department offers materials and training for on a variety of topics, including parenting education. Dads Make a Difference™ promotes positive father involvement. Educating Communities for Parenting is a private, non-profit organization focuses on promoting healthy family relationships. Improved Parenting offers two programs, one of which is entitled "Four Kids to Successful Parenting" and is available as an online streaming program that can be instantly accessed. The other is entitled "Improving Parent-Child Relationships" and is available as a 10-hour DVD set along with an 84 page online PDF viewer's guide. For more information on parenting workshops and curriculum guides, contact your local college or university and your local health department. In some cases, workshops may be offered for a free or reduced rate.